We’d love your help. Let us know what’s wrong with this preview of Everybody Out of the Laundromat, I Need to Think! by Phil G. Glenn. 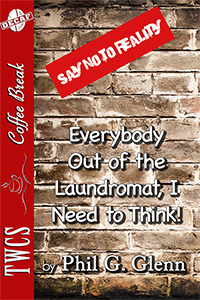 To ask other readers questions about Everybody Out of the Laundromat, I Need to Think!, please sign up. Be the first to ask a question about Everybody Out of the Laundromat, I Need to Think! this book was written in a simple dialect but was very humorous and brilliantly original. This a great standing on a bus read. More of a novelette than a novel. i bought this book on a whim, mainly coz I thought the title was pretty crazy. I must say it was a really surprising read and turned itself in to a political satire with a bit of Douglas Adams thrown in. It is brilliantly original and made me laugh out loud. The protagonist is Virgil Blaine who is basically a bum. The govt are struggling at the polls so they decide something different and radical which is to recruit shy people. Enter Virgil Blaine who is groomed to become a politician. At the en i bought this book on a whim, mainly coz I thought the title was pretty crazy. I must say it was a really surprising read and turned itself in to a political satire with a bit of Douglas Adams thrown in. It is brilliantly original and made me laugh out loud. The protagonist is Virgil Blaine who is basically a bum. The govt are struggling at the polls so they decide something different and radical which is to recruit shy people. Enter Virgil Blaine who is groomed to become a politician. At the end all he wants is his old life back. Its basically a novelette and I was quite sad when it ended. Unusually it includes footnotes which are an essential part of the story so don't forget to click on them. I was confused at first because I'd never footnoted on an E-book before but once i realised what i was supposed to do they were really funny. There is a second protagonist Doug Coulthard who is the President of this crazy poets club who consider themselves important political activists but in reality are just a bunch of crackpots who are all crazy in their own right. This is where Virgil Blaine meets the man who recruits him into politics. Virgil Blaine becomes a successful politician but the more his success the more he wants his old life back. This book was really funny and quite a surprise. i was told it was a political satire so I was expected to be bored but I just kept reading and loved it. There was some parts in the book that made me laugh out loud which is rare for me. Great read and highly original. I loved this humorous and witty book. The style of writing reminded me of the Hitch-hikers Guide to the Galaxy. The plot is well thought out and flows well. It was an enjoyable read and I look forward to more of this talented Author's work.